While hiking in my big backyard, the Pacific Northwest, sunburn avoidance isn't the first thing which leaps to mind. Basking in those ultraviolet rays from our Sun is a rare luxury! But that's exactly why northerners have to be extra-cautious when our sun-starved skin basks in solar rays - sunburn while hiking is a real "thing". Actually, sunburn avoidance should be on any hiker's list of techniques, regardless of location, because burned skin is damaged skin. And damaged skin sets you up for trouble later on in life. And I don't just mean wrinkles! So one of the best hiking tips I can give you is to be cautious with sun exposure. 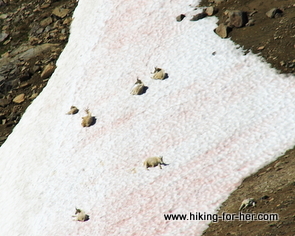 Are these mountain goats practicing sunburn avoidance? Or cooling off? Let's quickly go over a few ground rules on minimizing sun exposure. As the largest organ of your body not only by weight but also by surface area, your skin is built of multiple layers. When you look in the mirror, you are actually looking at dead skin cells in the stratum corneum ("horny" or hardened like a rhino horn layer). Kinda blows a hole in the whole cosmetics industry, when you think about it: slathering expensive products onto dead skin. Beneath those cells are other cell types in layers, one of which produces a dark pigment called melanin. It is this pigment that absorbs damaging ultraviolet rays during your hike. In fact, tiny packets of melanin form a protective umbrella over each cell's DNA, guarding the precious genetic messages encoded on each DNA molecule. Damaging the genetic message (DNA) by excessive amounts of ultraviolet radiation (i.e. sun exposure or tanning beds) in any cell can lead to irreversible changes which, given enough time, could cause skin cancer. That's why having a sunburn avoidance strategy should be on your "must do" list as a hiker, regardless of your skin tone. It's one of the very best hiking tips I can share with you. Now it's back to our lines of defense against skin damage. There are many brands of hiking clothing which promise extra UV blockage, in the form of UPF sun protection. In truth, any long sleeved shirt or pair of pants is a great UV ray blocker, as long as you use them! But there are reliable brands which use special fabrics, dyes, chemicals and designs to help keep you well protected long after the sunscreen has worn off. The white shirt in the photo below is my absolute favorite sun protective shirt, and you can find it either on me, or in my pack, 9 months of the year. On sunny days, it shields my skin from UV radiation. On cool days, it's an extra clothing layer. You can get your own right here. Dork hat = sunburn avoidance. A fair trade, at least on most days. Add a hat which shields your neck, ears, and face, and you're all set. Here's a suggestion: get a "dork" hat, like I have! Not very glamorous, but effective. And don't forget about your eyes. You'll need a high quality pair of sunglasses. Your eyes, especially if they're lightly pigmented blue or green, shouldn't be exposed to direct sunlight day after day, hike after hike, because of the risk of cataracts. 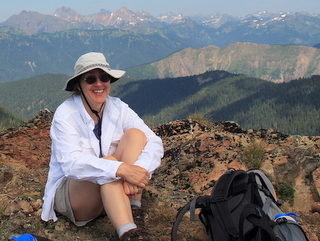 For more suggestions about UPF sun protective clothing for women hikers, read this. Next, sun avoidance behaviors (or behaviours, depending upon where you live). You want to be out on the trail during daylight hours. You want to soak up as much sun and scenery as you can during those precious trail hours. So how can you avoid the worst part of the day for UV exposure (10 A til 2PM)? Simple fact: You can't while you're hiking. Get to the trail head early, around dawn or shortly after. Wear appropriate clothing (see above). Apply sunscreen (see below) at least 20 minutes before you'll need it. Arrive at your turn-around spot (be it a waterfall, lake, summit, viewpoint, camp spot, cabin, river, whatever destination you have in mind) before the sun is directly overhead. Seek shade from 10A - 2PM, when the sun's rays are most fierce. Don more sun blocking clothing and a hat, and reapply sunscreen if your trail takes you onto exposed locations. Plan your hikes for extremely sunny days by pulling out your maps and looking for forest cover that you can retreat to as necessary. Drink lots of hiking water to help your body regulate heat and begin to replenish any sunburned cells. Build up your sun exposure gradually, allowing the melanin pigment in your skin cells to accumulate over a long time period. Short daily walks without sunscreen, or limited periods of yard work, will help you with this strategy. Sunscreen is such a blessing. It makes sunburn avoidance so easy! but here's one thing you absolutely must do: screen your sunscreen! Don't assume that what you are smearing onto your skin is safe. After all, ingredients can be absorbed directly into the lower layers of your skin. That's where your blood vessels are, providing a direct route into your body's circulatory system. So use only the best sunscreen (use my link above for some hints). One more thing: don't spare the sunscreen on cloudy days, because UV light can damage your skin even when it's overcast. Our Sol (sunny star) is really powerful! It's prudent to cover up your lips, too. Read my sunscreen lip balm review. Don't take your sun exposed skin for granted. Skin is not an inert stretchy cover, but a living organ which absorbs what you put on it, is nourished or harmed by what you ingest, and will erupt with rashes, bumps, blisters, or worse when it's not feeling well. For peace of mind, go to a dermatologist every year for a "mole check" and skin screening. S/he can help you figure out if that weird spot on the back of your leg is something to be concerned about, or not. Skin cancer shows up frequently behind the knees of sun exposed female hikers. For more information on avoiding skin cancer, go here. Now it's up to you to apply these strategies to your sun exposed trail time. Take the time to put barriers between your skin and UV radiation, either through sunscreens, sun protective clothing for hikers, or both. And if something looks weird on your skin, have it checked out sooner rather than later! I want you around for a long, long time on the hiking trail of life.